How to Configure Automatic On-Air Switching the Signals from External Lines? SL NEO servers allow the user to automatically switch signals on-air from one or several external lines. Switching management is implemented directly during the playlist execution: configuring an individual scheme of switching is possible for every program channel that is functioning at the SL NEO server. Ј Control of the external matrix switch by the scheme "switcher after server". According to the events in the executable playlist, the broadcast sources of signals (server outputs, broadcasting studios, mobile TV units etc) are automatically switched to the appropriate program output of the matrix, with frame-by-frame accuracy. Ј Switching input signals by the facilities of the server itself, from its inputs to the outputs. Switching is implemented with frame-by-frame accuracy and with the possibility of "preselection" of the external sources to the inputs of the matrix router controlled by the server and placed by the scheme "before the server". You can use any of the technologies or combine them. As a rule, such questions are discussed at the stage of building the functional scheme of the broadcasting complex. Variant 1. Setting up the Internal Program Switching with Using the Server Inputs. The Scheme "Switcher before Server"
SL NEO platform offers at least two solutions that allow users to broadcast signals from the SL NEO server's inputs to its outputs and control "internal" switching the input signals inside the server, simultaneously with the playout of files from the playlist. Ј Using the Background-layer for a program channel as a source of an input signal. Unlike the scheme "switcher after server", the use of program switching by the resources of SL NEO servers does not lock down the synchronousness, phase synchronism or even formats of the input SD/HD signals: switching will be implemented correctly and seamlessly, but the input signal will be delayed for a few frames (because of its buffering in the server's RAM). The advantage of this solution is absence of demands to the format (SD/HD) and synchronism of input signals, besides, there's no need to use external graphic stations: the design is implemented by means of the broadcasting server's resources (both during the playout of files, and in the process of broadcastings from external lines). First, create a LIVE-clip in the server database. ЂLIVEї is the specialized type of clip in the server database that contains a link not to the media file, but to the source of the signal/stream that comes to the server input. You can create a few clips, according to the number of server inputs, and then use them in the on-air broadcast playlist or as a part of graphic compositions. Creating new LIVE-clips is implemented in the client application Air Manager with working server software. The command New/Local Stream at the right part of the Media Browser window allows the user to create a new clip that contains a link not to the media file, but to the source of the signal/stream that comes to the server input. In the field Video Mode you can choose a standard of input video; in the field Local Stream name specify the name of a corresponding capture service. You can view the list and names of the configured services in the field Status of the server control panel. You should create a separate clip for every input. Created Live-clips may be used in a usual way (in playlists) and in graphic compositions. When the playlist is stopped, the signal from the server input may be broadcasted to the output. When the playlist is being executed, the file playout overlaps the input signal. For adjusting this mode you should set up the playout channel and specify a background-source for it (the capture service will serve as a background-source). The configuring process for this option can be implemented from the control web-console of the server (menu section Status, windows Program). You should choose the item Background in the window, then specify a type of source LIVE for it and choose the appropriate capture service. This function is optional and is not active in the standard set of the server functions. You need additional licensing to activate the function. You should connect the control port of the router to the server. The server has at least one control port RS-232 (COM1) that is placed at the back panel of the cabinet. If a router has a RS-422 control interface, you should use the interface converter or the board that has the appropriate ports. In some cases you may use Ethernet-interfaces for controlling the matrix. SL NEO platform supports protocols of controlling the switching equipment, made by Harris/Leitch, Evertz, Network Electronicz/Nevion, BlackMagic Design etc. Before you choose the model of a switcher and connect it, contact our technical service for more details of hardware compatibility and management protocols. The next step is connection of signals. Switching should be implemented according to the concept scheme of the path that is displayed at the picture for the given variant. Use of program switching by means of SL NEO server's resources does not impose any restrictions to the synchronism, phase synchronism and to the formats of input signals (SD/HD). Step 2. Stop the server software components, add a new device to the system. By the right click on the blue icon SL NEO in the taskbar, choose Stop Server and stop the server components. When the icon becomes red, right click on it and choose the item Configure Server Components. In the setting window find the router model in the field Available components (section Device Server/Router buses) and add it to the right field. Step 3. Launch SL NEO server software and configure the service for the switcher management. Choose Manage from the left menu of the console. Find the tab Router Buses and choose Service Enabled in the window Router Bus 1. In the field Connector choose the type of the control interface and the number of the port. Choose Add matrix in the field Matrixes. In the field Name of a new window you should type the unique random Latin name for the matrix in the system (for example, router1) and choose the switch dimension. You can leave the field Address †with no changes, if the value is localhost. Press Apply Changes at the top part of the server control console, to save the settings. Step 4. Check the router management from the application RT Client. You can find more information about the process of configuring RT Client in the appropriate description. Configure a rule at the server platform, according to which, with placement to the playlist of a Live-clip with a name that contains the source title (for example, a Live clip with the name studio1), the switcher will implement a certain switching 3 seconds before the changeover to the current Live-event. Configuring is implemented from the control web-console of the SL NEO server (menu section Manage, item Program Outputs). Find the item Actions in the chosen Program Channel, then find the field Playlist events and choose Add Action. Enter the parameters for a new rule (Action) into the opened window. In the window Action Configuration find the field Name and set a random name for the rule, in the field Layer choose "1" (the main fullscreen layer of the program channel), in the field Delay set the time value (in milliseconds) from the moment of the router triggering till the transition between events in the playlist. We have defined the time value as 3 seconds, so we should enter the value 3000 into the field Delay: actually, it means that the command for switching will be sent to the router 3 seconds before the transition to the LIVE-event in the playlist. The value in the field Delay shouldn't exceed 5000 (five sec), because the service Program Channel automatically starts to prepare the next clip for playout five seconds before the transition. The time value that is responsible for preparing the next clip is five sec - it is set by the software developer, so it cannot be changed or configured. In the field Address set the IP address of the server, or leave the field empty, if the value is localhost. Press the button ... in the field Service and choose a name of the service that you want to control - the service for controlling the switch RouterBus_1. In the window Action condition find the field Variable and define the playlist column that will be responsible for sending commands to the switcher. Choose Media URL (clip name) from the list, set the trigger as EQUAL, enter studio1 in the field Value. Activate only one parameter - Trigger at start when primary matches. Implemented settings in the window Action condition mean that the rule will trigger in case, when the clip with name studio1 will appear in the playlist column. In the field Param 1 of the window Action parameters you should set the unique name of the matrix in the system (router1 in our example, see "step 3"). In the field Param 2 set the number of the switcher's output that is physically connected to the server input, tied to the appropriate LIVE-clip (Capture service). In the field Param 3 set the number of the switcher's input that is physically connected to the signal from an external source (studio1 in our example). To save configurations, click Apply Changes at the top part of the control console window. Herewith, the playout channel with changed configurations will be reloaded, playback of the current channel will be stopped while reloading. You should implement the same configurations for the rest of LIVE-clips that are configured for receiving signals from external sources: every LIVE-clip that needs "preselection", needs its own rule. You can check the propagation of commands to the router in the application RT Client, or in the appropriate window Message (it may be opened by the right click on the icon of SL NEO server software, in the tray at the server console desktop, item Router Bus). Variant 2. Program Switching with Using the External Matrix Switcher. The Scheme УSwitcher after Server"
The scheme of building the path with synchronous sources is classic and historically developed, it needs certain costs for the main system of synchronization (REF), modules of frame synchronization for external sources, separate DSK modules and external graphic stations. This scheme proves its value in case of big number of sources - as a rule, federal broadcasting channels. You should connect the control port of the router to the server and implement settings described above (see the descriptions "step 1 - step 4Ф). The settings will be also implemented from the server control panel - Administrator Control Panel. Choose Manage from the left menu of the console, and then choose the tab Program Outputs. Choose the tab Automation in the window Program Output 1, then choose the item Routing Switchers. When you press Add youТll see a dialogue window, where you should specify the IP address of the server that has an activated service for the switcher management. In our case, the service is launched at the server itself (localhost), thatТs why you may leave the window empty. Leave the value У1Ф in the field Bus, in the field Name enter the unique name, previously set up for the matrix in the system (in our example itТs router1) and press OK.
Let's pass on to the item Parameters. 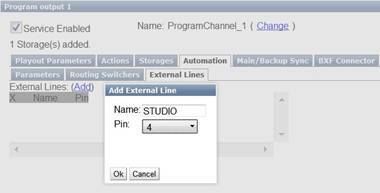 In the field Program output pin you should specify the number of the switcher output that you will use for reading the program signal of a current broadcasting channel. In the field Preview output pin enter the serial number of the switcher output that you will use for reading the preview signal. The preview signal is auxiliary: the system automatically switches the signal of the external line to the current output 10 seconds before the actual on-air switching; it gives the operator an opportunity for online control of a particular input signal at the monitor without any manual presetting. 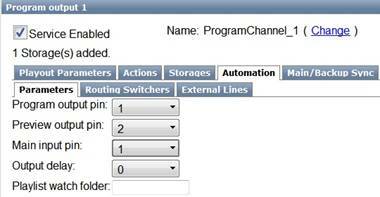 In the field Main input pin you should choose the input of the switcher, which, according to the scheme, is connected to the server playout channel that works on the given program channel. The parameter Output delay is responsible for the delay of the matrix switching in frames. The last step of adjustment is setting the external lines, it may be implemented in the item External Lines. By pressing Add you will open a window for setting a new line. In the field Name you should enter a random name for the source, in the field Pin you should choose the appropriate number of the switcher input. The source name that you enter into the field Name, will be used then in the playlist of the given program channel for specifying a broadcasting source (it will be entered into a column Player of the playlist). The system checks if you enter the name correctly, and if there are mistakes in the name of the external source, you will see a message УNo PlayerФ in the playlist line. You should perform similar settings for all of the program channels. To save settings you should press Apply Changes at the top part of the server control console window.